Recently, I realized I’m quite good -in all modesty- when it comes to finding cheap flights. I had a trip planned with some friends, and among us, I found the cheapest flight (by far!). However, I didn’t spend hours looking for a good deal. The thing is… Over time (and with my experience now! ), I acquired automatic reflexes without even realizing it, in order to find cheap flights. Flexibility is the keyword, I’m gonna use this term quite often throughout this article. If you’re flexible, believe me, you’ll go far away, without necessarily spending much money! Australians don’t pay much to go to Bali but from Europe, it’s also possible to limit the damage! So I’m gonna list some advice to follow in order to find flights without breaking the bank. Needless to say, I assume you’re looking for flights online. No one among my friends and family still goes to a travel agency to pay for a flight and honestly, I suggest not to do it. First off, you cannot be flexible, and you’ll depend on the few flights the travel agent will offer you. And of course, they take a commission when you pay for a flight at the agency. Not only you’re gonna waste your time going there, but it’s also gonna be more expensive! There’s an exception. You have to buy a very expensive flight, and the payment cannot be done with your card. In this case, you have to go to an agency… Anyway, follow this guide in order to find cheap flights! How to avoid those falsely inflated prices? Go incognito! In the menu of your browser, click “New incognito window” or “Private browsing window”. You can also use keyboard shortcuts. In Google Chrome or Safari, hit Ctrl (or “Command” if using a Mac), Shift, “N”. For Mozilla Firefox or Internet Explorer, hit Ctrl (or “Command” if using a Mac), Shift, “P”. When you’re incognito, your previous searches aren’t “recorded”, and the prices won’t be inflated. Each time you want to search for a new flight, don’t open a new tab. Close all your incognito windows, and open a new one. Of course, stay incognito! You always need to be flexible when it comes to travel dates. Sometimes, by moving your flight forward or moving it back, ticket prices can drastically plummet! My flight ticket from Singapore to Bali was twice less expensive when I realized that the price wasn’t the same at all if I booked it one day later! Usually, flights from Friday at 10am to Monday at 2pm are more expensive! It’s logical, since most people take flights during the weekend! It’s easier said than done but if you can, try to fly during the middle of the week. Flights are cheaper. Likewise, early-morning and late-night flights. Again, it’s logical, since people want to fly during convenient hours! Usually, airlines know when people are about to fly, and they inflate their prices accordingly during those periods : holidays, Christmas, New Year’s Eve, etc… If you fly off-season, or right after a major holiday, your flight ticket will be cheaper. Likewise, it seems that flight tickets are cheaper when you buy them in January! It’s more complicated for a lot of people, especially when you already decided where you want to go on vacation. But you need to stay open to all possibilities in order to find cheap flights. Sometimes you can go to a country you hadn’t planned on visiting, when you find out there are cheap flights to get there. Likewise, check if it’s possible to pay less by changing your departure and/or arrival airport. In order to do so, opt for large hubs. There are more airlines in those big airports, which means more competition to attract customers, so prices are lower. You’ll find a list of airline hubs here. All right, you’re now incognito, ready to be flexible with your travel dates and destination… But where can you find cheap flights? Singapore is an Asian airline hub. There’s not a single search engine better than all the other ones to find cheap flights. Therefore you have to check several of them. It’s useless to search for flights checking all of them, there are dozens of flight search engines, and you’re gonna waste a lot of time. I have a preference for Skyscanner. I searched for a lot of flights on several flight engines and to me, it carries off the laurels. That doesn’t mean you have to search for all your flights on this website. I also recommend to check Momondo, and definitely don’t forget Google Flights, very efficient! Definitely don’t search for flights using tour operator websites like Expedia. They’re affiliated with airlines who pay them to have their flights appearing as the cheapest ones on the search results! Usually, I first check Skyscanner. Then my second stop is Momondo, followed by Google Flights, and I finally check the airline’s website (it’s often cheaper when you directly buy on the airline’s website, and in case of a mishap, it’s easier to reach them). But there are also excellent flight search engines like Kiwi or Kayak, if you want to find cheap flights! If you want to pick a destination based on prices, use tools like Skyscanner Inspire Map or Google Explore from Google Flights. You’ll see a price map for different destinations based on your departure airport. Very useful to pick your destination based on prices. On Skyscanner, you can also type your departure city and “everywhere” in the arrival city field. They’ll show you the cheapest destinations. You can also type your departure city, and your arrival country. Skyscanner will find the arrival airport where flights are the cheapest ones for you (example : Bangkok, or Phuket, or Chiang Mai). 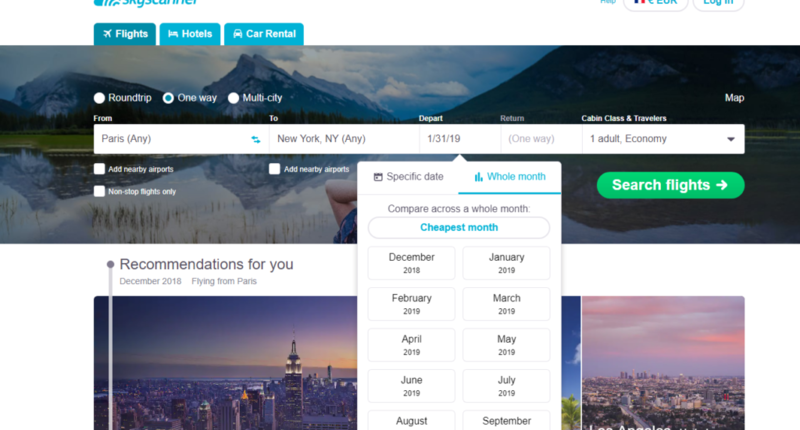 If you want to pick a date based on a destination, type your destination on Skyscanner, and select “Whole Month”, and then “Cheapest Month”. The date with the cheapest flight will appear. You can also select a whole month, and Skyscanner will show you the date with the cheapest flight for that month. A lot of budget airlines don’t appear in the results of flight search engines, because they don’t want to pay them a fee. To offer cheap flights, they minimize their costs. That means you have to visit directly their websites to see the prices they offer. Especially since -you already know- their prices are much lower. However, low prices also means charging extra for services that are normally free on classic airlines. You need to pay for checked bags, food, drinks, legroom, credit card payment, etc… When you fly with a budget airline, make sure to check the airport location, often further out of town). Skyscanner Inspire Map. Most budget airlines don’t appear in the results of flight search engines. You need to check all those things when you book a flight with a budget airline, and also watch if you can uncheck boxes they already checked (especially regarding insurances). What are the budget airlines? There are hundreds of them, the most famous being Ryanair, Easyjet, Norwegian Airlines, Wow Air, Spirit, Southwest, JetBlue, JetStar, Air Asia, Tiger Air… You have a full list here. Quite often, flights with a layover are cheaper. Indeed, who wants to be bothered with a two hours layover, when you can go straight to your destination if you pay a little bit more? But sometimes, layovers are a good thing. For long-haul flights, sometimes you’ll realize it’s a lot cheaper to book two flights separately, rather than buy one with a layover. Sometimes, it also works when you buy two one-way ticket, rather than a return trip (but it’s rarer). You have to experiment and see what you come up with! If you book two distinct flights to go somewhere, make sure to take into account the time you have between those flights, and make sure you don’t have to go to another airport! Be cautious though, if something goes wrong with your first flight and you miss the second one, you’re gonna lose your ticket! As simple as that! I said it earlier, you need to be flexible on departure and arrival airports. Are you going to Phuket from Europe? Take a flight to Bangkok, then another one to Phuket. It’s gonna be cheaper! One example? From Seoul, I had to go to Tokyo. The cheapest flights I found were like 200 euros minimum!!! I played around with flights on Skyscanner, and I found a 50 euros flight from Seoul to Kagoshima! Then the journey from Kagoshima to Tokyo was free (included in my Japan Rail Pass). I saved 150 euros! Another exampe? From Paris, I had to go to Austin, Texas. The cheapest flight was 300 euros with at least one layover. Again, I did my research and I found a direct flight from London to Austin, and it was 150 euros only! From Paris, I paid 30 euros to go to London and from there, I took my flight to go to Austin! I saved 120 euros! Everytime you book flights separately, make sure you have at least two hours between two flights. Actually I’d say three hours, especially if you arrive from abroad and you have a layover in the US (going through customs take a lot of time there…). When you sign up for cheap fare alerts, search engine flights, or airfare websites, sometimes you can unearth very good deals. I remember this two-way trip from Paris to Lanzarote a few years ago, which was 50 euros only… Nowhere to be found on the internet, I received this offer in my inbox! Think about it! Apart from the airlines’ websites, there are websites like Holiday Pirates, The Flight Deal, Secret Flying… They all offer great deals! Here you are under the sun, and you didn’t pay much, because you kept an eye on the good deals! Sometimes, you don’t need to search for cheap flights, those cheap flights come up to you! Indeed, when you sign up for an airline rewards program, you earn miles that translates into free flights or upgrades. We call it travel hacking. Unfortunately, I cannot really go into more details because each market (the US, the UK, Australia…) has its own specificities. But I recommend you to sign up for an airline rewards program. Moreover, if you sign up for a credit card, you can earn miles without actually flying (just using your card to buy, taking surveys, etc…). I already tried, and it works! Sometimes, airlines are charging different fares for the exact same flight, depending on where you’re from! I met a Thai guy who had to pay twice less expensive the exact same flight as mine (he was paying in baht, I was paying in euros). When you use a VPN, you get around the problem because you can locate yourself wherever you want. If you’re using a strong currency (euro, but also british pound, US dollar…), it’s worth it to try! You can have a nice surprise doing so! I use ExpressVPN. It’s easy, cheap, they have an app, and it doesn’t slow down my connection! You need to take a one-way ticket? Still, have a look at the prices for a two-way trip, sometimes it’s cheaper! Just use one-way. Be careful, it doesn’t work the other way around. If you don’t take the first flight, they cancel your booking of the second one! When is the best moment to buy a flight ticket? It’s impossible to really know, people contradict themselves… Generally, people say you have to buy a ticket around 20 weeks before your flight during high season, and 6 to 8 weeks before during low season, or (sometimes) at the very last minute. But there’s no exact science because of the yield management (variation of prices depending on a lot of factors : dates and time of the flight, occupancy rate, oil prices…). You found a cheap flight, but it left and arrived very late? You can ask for an indemnification! You’ll have to battle for your money but that’s the law! Most people ignore it! All right, I think that’s it! You shouldn’t take more than 30-45 minutes to find a cheap flight, it doesn’t have to be a chore! Do not hesitate to tell me if you have other tips to find cheap flights! As usual, do nt leave home without a travel insurance! And if you’re about to travel soon, check my travel resources page! Lovely blog posts, thank you very much. Great Opportunity to get this deals. Book Taj Mahal Sunrise Tour program which gives the perfect travel blogs. These are excellent tips, and very inclusive of things that come up during most travel experiences. The Skyscanner Inspire Map tip is especially helpful. Thanks for sharing! Thank you! Glad to know my article is useful! It is really valuable blog for me. It is truly a great and useful piece of info. I’m happy that you shared this helpful information with us. Please keep us up to date like this. Thanks for sharing.